It’s the time of year for winter vegetables; parsnips, rutabagas, potatoes, turnips, carrots and of course…..brussels sprouts! Most people make an icky face when I mention brussels sprouts. The poor little vegetable that looks like a miniature cabbage just doesn’t get enough respect. I can’t figure out why. We love them in season and gobble them up around our house. If you ask my kids, they will tell you it’s their favorite vegetable. The nutty, woodsy flavor is interesting and satisfying. Give ‘em a try sometime. 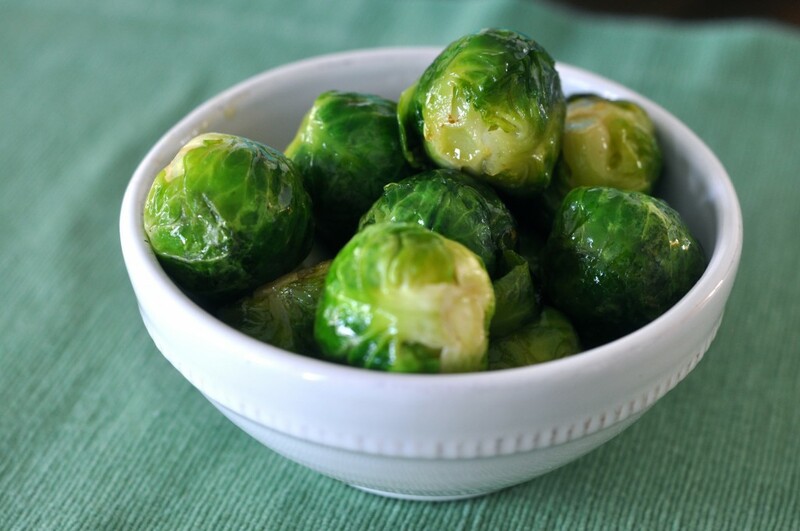 Brussels sprouts didn’t actually originate in Belgium, but were named after the capital city since the country is the epicenter of world sprout production. 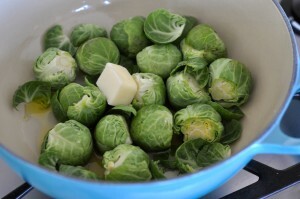 Hmmm….maybe one of the reasons I love the sprouts so much is because I have a bit of Belgium (Belgish?) in me. My favorite technique for cooking sprouts is steam and sauté, which by the way is also a great technique for lots of winter vegetables. I cut the core off the end of the brussels sprouts and steam them in a sauté pan in water, olive oil and a little bit of butter. Just when the sprouts turn a bright vibrant green and are almost cooked, the water has magically evaporated and the sprouts begin to sauté in the leftover olive oil and butter. At this point it is time to salt and pepper to taste. If there happens to be a bit of water still left over when the sprouts turn bright green and are cooked to the firmness you desire, just drain the excess water off to get the sauté started. Cooking too long in the water makes for mushy sprouts….ewwww! 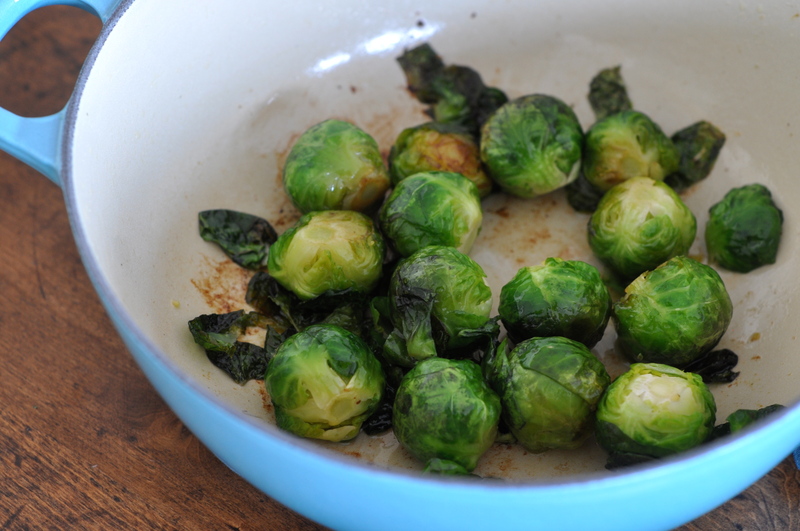 The sauté step caramelizes the outside of the sprouts and makes them oh-so-wonderful to nibble on. Another favorite technique is roasting. After cutting the core off the end of the sprouts, toss them in a little olive oil, salt & pepper. Spread the sprouts on a sheet pan. Roast at 400 degrees for about 35-40 minutes. Toss and serve immediately. I frequently julienne my sprouts and quick sauté them in olive oil and butter. Delish! I have a fab raw brussels sprouts salad that is to die for, but I will save that for another post. I can’t wait to hear about all your adventures with the sprouts. Enjoy! Wash the sprouts. With a sharp knife cut the core end off the sprout. Warm the olive oil and butter in a sauté pan over medium heat until the butter melts. Add the sprouts and pour water over them. Cook for about ten minutes until the sprouts turn bright green and taste cooked through. If there is any remaining water in the pan, drain it off. The sprouts will now sauté in the butter and olive oil. Salt and pepper to taste. Sauté over medium heat until caramelized, about 3-5 minutes. Serve immediately. 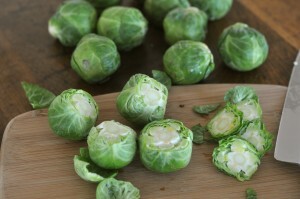 I can honestly say I do not think I have EVER had a brussel sprout and I love veggies. You have inspired me to try them.